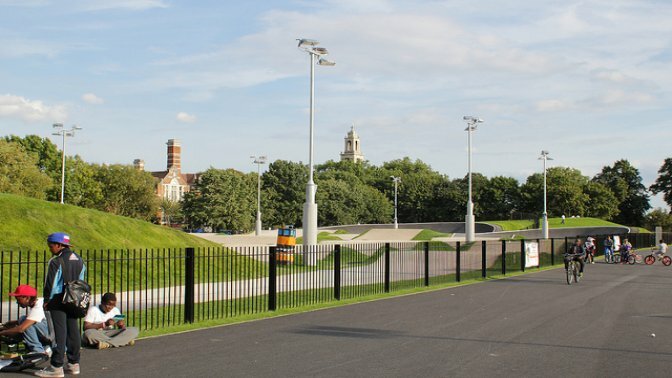 Burgess Park’s BMX track, a project on which Alpha Rail supplied metal railings and gates, has been awarded a prestigious BALI National Landscape Award. The BALI awards are held annually and recognise exceptional excellence in landscape design, construction and maintenance by members of the British Association of Landscape Industries (BALI). Burgess Park’s BMX track, constructed by Ground Control Ltd, won two awards for a Restoration and Regeneration Scheme and a Community and Schools Development scheme. Forming part of the £26 million master-plan for Burgess Park, the dilapidated adventure playground and kart track site was identified as the location for the creation of a new national standard BMX track with associated hard and soft landscaping. The site had been disused for many years and was blighted with anti-social behaviour in one of London’s most deprived areas. The completed track is now one of the largest BMX tracks in the UK. It features a 350 metre track with three 3 metre high berms and its 70 metre pro straight is one of the most challenging in the country. Alpha Rail were appointed by Ground Control to supply new 1400mm high blunt top vertical bar metal railings supplied in a galvanized finish. Click here for information on other BALI award winning projects.